Job flow set up to have parallel stages displays as a distorted flow, regardless of browser (FF or Chrome) or browser window size. The JIRA form won't let me specify the exact version I'm using, but it's 0.7.1 (the latest, I believe). Johan, it is because of the longer stage name "OOSS-create-version". We need to handle longer stage name in a better way in the plugin. Patrik Boström added a comment - 2014-03-19 16:53 Johan, it is because of the longer stage name "OOSS-create-version". We need to handle longer stage name in a better way in the plugin. Yes, the other project has a shorter stage name. 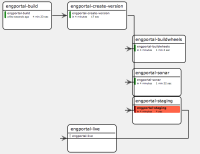 Johan Bloemberg added a comment - 2014-03-19 17:05 Yes, the other project has a shorter stage name. Johan, I have created JENKINS-22327 for the long stage name bug. Patrik Boström added a comment - 2014-03-24 16:55 Johan, I have created JENKINS-22327 for the long stage name bug. This is still not working for me, with version 0.7.2. I have multiple pipelines representing multiple maintenance branches of the same codebase, and each pipeline has the same stage names and step names. They are all using different projects though (all projects are duplicated for each branch/pipeline). What happens is that the top pipeline has the proper arrows in the view, and the bottom one has all the arrows from the first stage going all the way up to the second stage of the top pipeline (the remaining stages on the bottom pipeline just aren't part of the graph). All pipelines in between the top and bottom ones have no arrow/lines. If I add a completely different pipeline at the bottom, then it won't have any lines/arrows at all, but it won't point t the top pipeline, so I think it's related to the fact that I'm using the same stage/step names.